A player in a pickup basketball game in Loudoun County called 911 to report he had been fouled — and a sheriff's deputy responded. STERLING, Va. — It’s not a typical cops and courts case: A player in a pickup basketball game in Loudoun County called 911 to report being fouled hard. 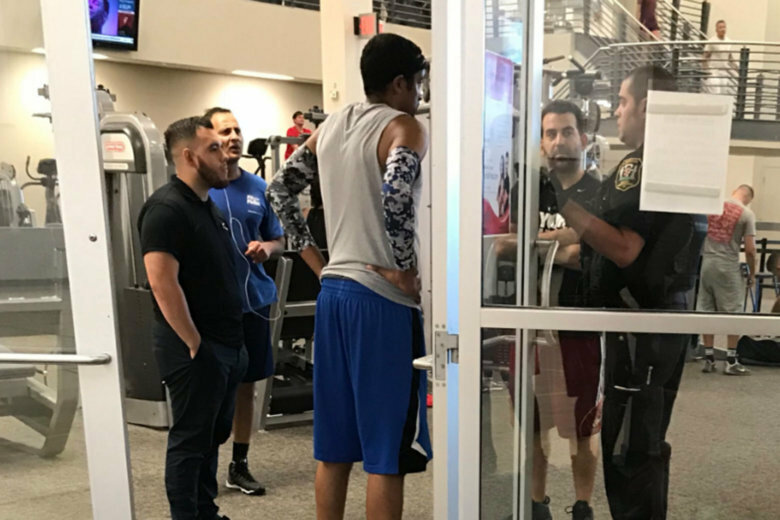 At LA Fitness in the Dulles Town Center on Monday, during a spirited game between friends and acquaintances — without a referee present — one player sought the help of the Loudoun County Sheriff’s Office. A sheriff’s deputy responded, and, the crowd — on Twitter — went wild. Thomas Mulabah was one of the players in the game. One player, after getting fouled, said he was going to call police. Within minutes, a sheriff’s deputy arrived at the gym, to investigate what the sheriff’s incident report described as an assault. According to the report, obtained by the Huffington Post, both players admitted fouling each other, and said they didn’t want to file reports. “Management gave subjects one more chance to keep the game civil, if not they will both be removed from the gym for the day,” the incident report concluded. Mulabah said the player who called 911 was likely caught up in the emotion of the game.